Researchers have observed wild-bearded capuchin monkeys in Brazil deliberately break stones, unintentionally creating flakes that share many of the characteristics of those produced by early Stone Age hominins. The difference is that the capuchins' flakes are not intentional tools for cutting and scraping, but seem to be the by-product of hammering or 'percussive behaviour' that the monkeys engage in to extract minerals or lichen from the stones. In a paper, published in Nature, the research team says this finding is significant because archaeologists had always understood that the production of multiple stone flakes with characteristics such as conchoidal fractures and sharp cutting edges was a behaviour unique to hominins. The paper suggests that scholars may have to refine their criteria for identifying intentionally produced early stone flakes made by hominins, given capuchins have been observed unintentionally making similar tools. The research is authored by researchers from the University of Oxford, University College London and University of São Paulo in Brazil. The team observed individual monkeys in Serra da Capivara National Park unintentionally creating fractured flakes and cores. While hominins made stone flake tools for cutting and butchery tasks, the researchers admit that it is unclear why monkeys perform this behaviour. They suggest that the capuchins may be trying to extract powdered silicon (known to be an essential trace nutrient) or to remove lichen for some as yet unknown medicinal purpose. At no point did the monkeys try to cut or scrape using the flakes, says the study. Lead author Dr Tomos Proffitt, from the School of Archaeology at the University of Oxford, comments: 'Within the last decade, studies have shown that the use and intentional production of sharp-edged flakes are not necessarily linked to early humans (the genus Homo) who are our direct relatives, but instead were used and produced by a wider range of hominins. However, this study goes one step further in showing that modern primates can produce archaeologically identifiable flakes and cores with features that we thought were unique to hominins. The monkeys were observed engaging in 'stone on stone percussion', whereby they individually selected rounded quartzite cobbles and then using one or two hands struck the 'hammer-stone' forcefully and repeatedly on quartzite cobbles embedded in a cliff face. This action crushed the surface and dislodged cobbled stones, and the hand-held 'hammer stones' became unintentionally fractured, leaving an identifiable primate archaeological record. 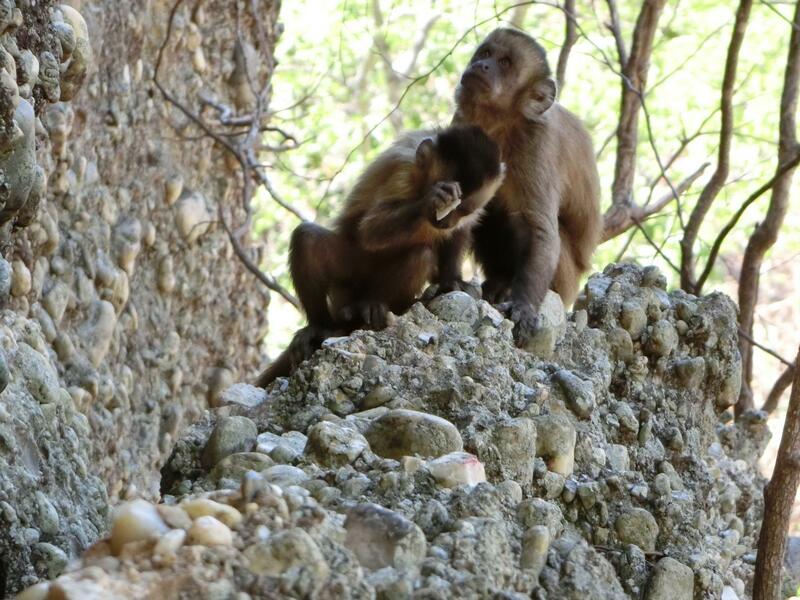 As well as using the active hammer-stone to crush 'passive hammers' (stones embedded in the outcrop), the capuchins were also observed re-using broken hammer-stones as 'fresh' hammers. The research team examined 111 fragmented stones collected from the ground immediately after the capuchins had dropped them, as well as from the surface and excavated areas in the site. They gathered complete and broken hammer-stones, complete and fragmented flakes and passive hammers. Around half of the fractured flakes exhibited conchoidal fracture, which is typically associated with the hominin production of flakes. Bearded capuchins and some Japanese macaques are known to pound stones directly against each other, but the paper remarks that the capuchins in Serra da Capivara National Park are the only wild primates to be observed doing this for the purpose of damaging the stones. A video is available to media of the wild-bearded capuchin monkeys in Serra da Capivara National Park, Brazil, performing percussive behaviour with hammer stones. Contact [email protected] to request it. (It must be credited to M.Haslam and T. Proffitt of the Primate Archaeology Group, University of Oxford). There are also photographs of the monkeys available to media which should be credited to Michael Haslam/ Primate Archaeology Group. The study was funded by a European Research Council Starting Investigator Grant (#283959) to M.H. and São Paulo Research Foundation (FAPESP) awards to T.F. (#2013/05219-0) and E.B.O. (#2014/04818-0). Support for fieldwork and analysis was provided by N. Guidon and G. Daltrini Felice of FUMDHAM and University College London (ERC Starting Grant #283366).